We are so confident in the products and services that we provide, that we will provide a parts and labor guarantee it for two full years on all new installations. The Project Promise will give you the peace of mind knowing that if there is a problem with your unit, we will be there to fix it for free for the first two years. That’s parts and labor! 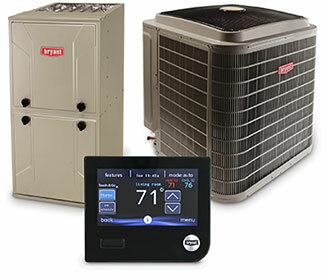 At Project Heating and Cooling, we are also about making you feel comfortable about your decision to choose Project. Your Project representative will give you all additional details. Don’t hesitate to ask any questions you might have; our team loves to educate! New high efficiency comfort systems are proven energy and money savers. With an energy efficient system, the higher the efficiency rating, the more energy (and money) you save. Many comfort options can help reduce energy costs by 30% to 50%. A high efficiency system can add thousands of dollars to your home’s resale value. According to the EPA, human exposure to indoor air pollutants may be 2-5 times higher than outdoor levels. Pollen, mold spores, pet dander and other airborne allergens can aggravate indoor allergy and asthma symptoms. Microscopic dust can increase cleaning time and costs. Three main factors affect your comfort: humidity, temperature and sound. Indoor air that is either too damp or too dry can create discomfort. Our indoor units can provide virtually silent operation! with our 100% No Lemon Full Replacement Guarantee. If either the compressor, blower motor, or coil fails within the 5 year full labor period more than once, Project will replace the affected portion of the system at no charge to you. on any system installed by Project Heating & Cooling. We so strongly believe that nobody can provide a more complete package of warranties, guarantees, and protections that we will match any competitor’s price if they provide an apples-to-apples package. Now there’s a way to find out if your heating and cooling system is really doing its job—And it’s free! Do your heating and cooling bills seem too high? Is your indoor or outdoor unit (or both) too noisy? Does the air in your home seem too humid in the summer or too dry in the winter? Are there rooms in your home that are always too hot or too cold? Does your furnace short-cycle (constantly turn on and off)? Is your system’s air filter easy to get to and change? Is your outdoor unit noisy or not aging well? If your answers to these questions make you think it might be time to have your home energy system checked out, we have great news for you! Smart features, customizable touchscreen, and simple setup, plus Wi-Fi remote access. Cost savings, simple setup, and Wi-Fi remote access, plus a convenient push button interface. Don’t Need Wi-Fi Remote Access? Check out other dependable Honeywell programmable and non-programmable thermostat models.